Every once in a while, an album comes along that’s a breath of fresh air…a statement of substance and grace that reminds us of life’s bigger picture: keeping a marriage afloat, raising children, dealing with death, loving your partner, finding yourself, claiming your independence. 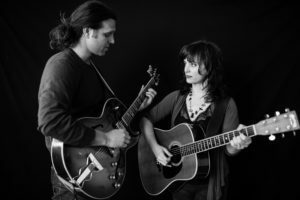 On Goodnight Moonshine’s “I’m the Only One Who Will Tell You, You’re Bad,” the duo delivers a funny, smart, explicit, raw, honest, mature, witty collection of Folk-Pop songs that reflect the messiness of ‘partnership’ (in its many forms,) parenthood and growing up, while evoking the emotionally resonant aesthetic of Shawn Colvin and Patty Griffin. Molly Venter’s voice bends from a sweet moan to a gritty shout and back into a playful run in the space of a few bars and “it all goes down like silk,” writes American Songwriter Magazine – “few singers turn first time listeners into eternal fanatics as effortlessly as Molly Venter.” The emotional potency of her voice is surrounded and supported by a lush landscape of harmonies and minimalist orchestrations conceived by Eben, on vocals and electric guitar. Co-writing often, the couple uses the creative process to explore a healthy authentic relationship. Both wholesome and irreverent, they sing of grief and joy in equal measure; Molly gives smooth delivery to Eben’s assertions while Eben gives form and focus to Molly’s raw passion. Their music encourages listeners to embrace opposing desires, to challenge as well as support each other through inspiration and dissolution, and hopefully to share this journey with their larger communities. Venter’s voice has caught the ear of industry giants, and been prominently featured on FOX television, Apple Computers and in Warner Brothers films. Molly and Eben’s Co-write “Willow Tree” was a #1 hit on the folk charts in 2014 and was featured in USA Today.